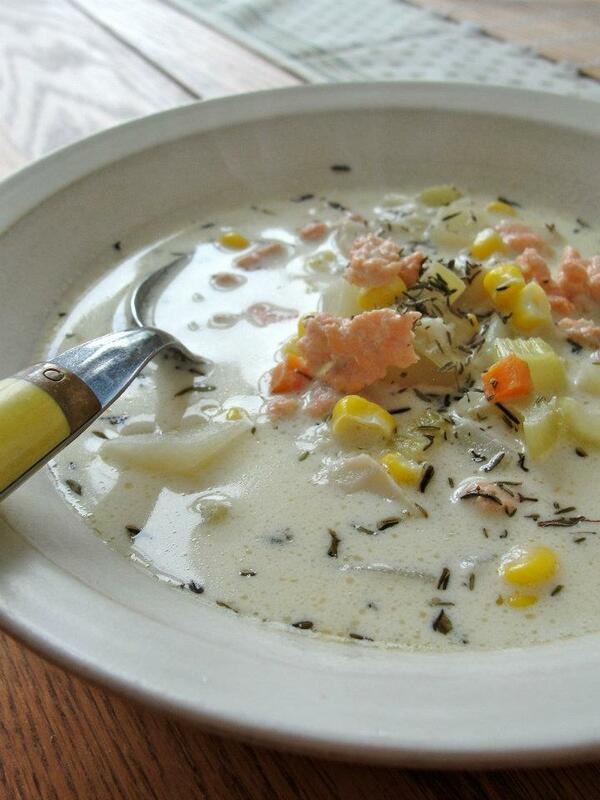 This is a thin, mild chowder with flavors of salmon, fennel, and thyme, and sweetness from tarragon and sweet corn. Other modifications: I substituted celery for zucchini and diced white onion for leek. My original intention was to make a salmon chowder, but having had only about a pound of salmon bones and fin portions (the butcher’s leftovers – hey, it cost $1) with only a modest amount of edible fish meat, I added 1/2 pound of bite-sized pieces of tilapia fillets. Also, I used slightly less fennel seed than the recipe suggested since a fair number of people seem to object to the flavor if it’s strong. A tip: if you buy frozen tilapia fillets, I suggest thawing them in water instead of the microwave, because they can overcook easily and get a rubbery texture.